This is a common way to refer to ceiling fans with stained glass lighting and/or designs. Either the fan includes a light fixture with tiffany-style glassware, or the ceiling fan motor is encased in a stained class housing. With the latter, usually there are low wattage light bulbs inside the housing that allow it to glow. This light is usually not bright enough to use for general lighting, it is more for decorative purposes. It is important if you are also using the fan as a light fixture to make sure it includes a fairly bright downlight as well. 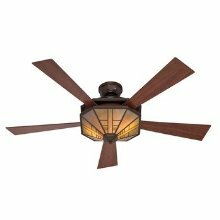 The best quality tiffany-style fan is the Emerson Raphael, which uses a K55-type motor (see Emerson Ceiling Fans). 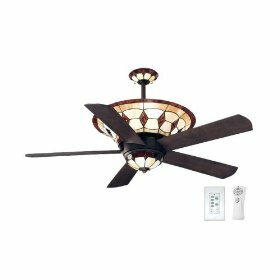 Many other manufacturers offer similar fans, such as the Hunter Charmaine (see Hunter Ceiling Fans), the Fanimation Belize (see ), and the Hampton Bay Dragonfly (see Hampton Bay Ceiling Fans). Mission style fans are also very similar, using art glass instead of tiffany glass. Both Hunter and Casablanca offer specific Mission models. These manufacturers have lovely Tiffany style options available. If you are looking for a specific Tiffany ceiling fan and you cannot find it, please feel free to use our contact us page. We will do our best to find the Tiffany style ceiling fan you are looking for and get it added to the website. One example of a Hunter Tiffany ceiling fan. This is the 1912 Hunter Mission Ceiling Fan. It features a high performance motor, three speed pull chain, and limited lifetime warranty. This is one of the few remaining fans available which still has a very contemporary feeling to it, like it came from a previous era - because, well, it did! There are not many other ceiling fan manufacturers that can rival Hunter's ability to produce an authentic vintage Tiffany Ceiling Fan. We will be adding more Tiffany style ceiling fans to the website as time goes on, so be sure to check back often to find more Tiffany ceiling fans. This style of ceiling fan is quite lovely and often very detailed in terms of the design. 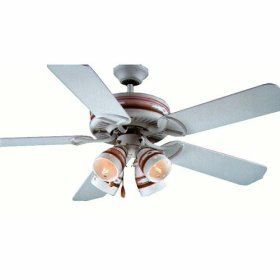 If you are a fan of the Tiffany style, be sure to check out the above mentioned Mission style fan. We hope you enjoy browsing here at Ceiling Fans 'N More.